The week’s top class action lawsuits and settlements including Fresenius Granuflo Dialysis lawsuits, Auto Workers denied severance, and Cipro anti-trust partial settlement. Tina Nunn, who filed the lawsuit on behalf of herself, her late husband, and those similarly situated, alleges that the dialysates caused fatal complications and sudden death, and caused her husband to incur substantial medical expenses prior to his death. 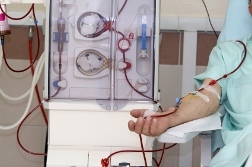 According to court documents, Earin Blossom began hemodialysis treatments in November 2010. During the course of those treatments, which took place three times a week at a Fresenius dialysis clinic in Fremont, he received both Granuflo and Naturalyte additives. Then, on April 6, 2011, just a few hours after completing a dialysis treatment at the clinic, Blossom suffered a massive heart attack and died. The lawsuit alleges that Blossom’s metabolic alkalosis, cardiac arrest and subsequent demise were a direct and proximate result of his use of Granuflo and/or Naturalyte. The lawsuit also claims that the defendant knew its products resulted in excess bicarbonate levels in patients, often leading to metabolic alkalosis, a dangerous condition associated with heightened risks for heart attack, cardiac arrhythmia and sudden death. An internal memo issued by Fresenius on November 4, 2011 warns that the GranuFlo and NaturaLyte products could lead to a greater risk of cardiac arrest and other heart problems. The memo, which was anonymously leaked to the FDA earlier this year, warned doctors working in Fresenius dialysis centers only that 941 dialysis patients suffered cardiac arrest in 2010 from GranuFlo use. Dangerously high biocarbonate levels would put their patients at a risk of cardiac arrest up to six times higher than that of patients using competing products. Auto Workers Get $6M. And justice for all…all employees that is—and in this particular case it takes the form a $6 million settlement of a California labor law class action lawsuit alleging discrimination and unfair dismissal. Brought by former employees of Freemont-based New United Motors Manufacturing, Inc. (NUMMI), California’s last auto plant, the lawsuit, alleged that employees who were on disability at the time of the plant closure, were denied the severance benefits. Specifically, the NUMMI workers’ lawsuit alleged that employees who were on disability in the period between October and the plant’s closure on April 1st did not receive benefits and services offered to employees who were not on disability during that same period. Those benefits and services included a severance package including a base payout with an additional retention bonus determined by years worked at the plant. The plant employees working between October 1st and April 1st were also offered transitional services, including access to a one-stop center, career and educational fairs, and skills assessments. The plaintiffs also claimed that they, being on leave due to their disabilities and/or NUMMI’s refusal to accommodate their disabilities, were unjustly denied the bonus enhancement and transitional services. Further, the workers alleged in their complaint to the Equal Employment Opportunity Commission (EEOC) that they were physically capable of returning to work during the severance period, but were denied reinstatement. The EEOC issued “right to sue” letters to several NUMMI workers, while retaining the right to continue its investigation. While the EEOC charges were pending, a group of former employees filed a federal lawsuit in the United States District Court for the Northern District of California. The plaintiffs filed claims for declaratory and injunctive relief, as well as damages for violations of the Americans with Disabilities Act, The Fair Employment and Housing act, the Unfair Business Practices Act, and California’s Public Policies. The plaintiffs sought reformation of the severance agreement, restitution, lost compensation and other employment benefits and compensatory and punitive damages, and reasonable attorneys’ fees and costs for the defendants’ violations of their rights. Defendants named in the suit included New United Motors Manufacturing, Toyota Motor Corporation and Toyota Motor Sales. A class certification was later granted. Prior to the EEOC’s filing its own lawsuit, the matter was resolved via settlement for $6 million. As a part of the settlement, NUMMI entered into a conciliation agreement with the EEOC. Floxed But Not Fleeced? Last—but certainly not least—the 900lb gorilla—Bayer—reached a partial settlement in an antitrust class action lawsuit involving the prescription antibiotic Cipro. The lawsuit claims Bayer Corporation, Barr Laboratories, Inc., Hoechst Marion Roussel, Inc., Watson Pharmaceuticals, Inc., and The Rugby Group, Inc. violated antitrust and consumer protection laws by agreeing not to compete with each other, and by keeping lower-cost generic versions of Cipro off the market. This settlement is with Bayer Corporation only; the case against the other manufacturers continues. FYI—neither the case nor the settlement is about the safety or effectiveness of Cipro. Bayer has paid $74 million into a settlement fund that will compensate consumers and third-party payors (Class Members) who paid or reimbursed for Cipro in California between January 8, 1997 and October 31, 2004. Cipro purchasers not eligible for settlement payments include: (1) anyone who received Cipro through the MediCal Prescription Drug Program, (2) anyone who purchased Cipro to resell it, (3) government entities, (4) the manufacturers and related entities being sued, and (5) all purchasers of Cipro who paid a flat co-payment and who would have paid the same co-payment for a generic version under their health insurance policy. Individual payments will be based on the total number of valid claims filed and how much the Class Member paid or reimbursed for Cipro. Attorneys’ fees not to exceed one-third of the fund, litigation costs, and other fees and expenses will be deducted prior to distribution. Full details about the settlement can be found in the Settlement Agreement, which is available at www.CiproSettlement.com. Class Members must submit a claim form by March 31, 2014 in order to get a payment. The claim form and instructions on how to submit, together with complete details of the settlement are available at www.CiproSettlement.com. The top class action lawsuits and settlements for the week ending June 21, 2013. Top stories include intern pay, McDonald’s paying workers with plastic, and the much-awaited Flonase settlements. Unpaid Interns Going for Big Payday… or at least their day in court. A former unpaid intern at Atlantic Records claims the record company required him to work full-time over eight months without pay, often 10 hours a day, according to a proposed employment class-action law suit filed in State Supreme Court in Manhattan. Of note, the Atlantic Records class action is the first unpaid internship lawsuit to be filed against a music industry business, according to lawyers involved in lawsuit; the class action alleges that Atlantic Records and its parent, Warner Music Group Corp, violated New York State Labor law by requiring the intern, Justin Henry, of Brooklyn, to work full time without pay. Henry was an intern in 2007 for Atlantic engaged in filing, faxing, answering phones and fetching lunch for paid employees, according to the suit. He alleges his internship existed solely for the benefit of Atlantic Records, and that he received no training or mentorship. Sadly, we’ve heard this before. According to the Fair Labor Standards Act and New York Labor Law, unpaid internships must exist for training purposes and employers may derive “no immediate advantage” from the work provided by interns. So, Henry is seeking to recover unpaid minimum wages ($7.15 per hour) and overtime, as well as attorney’s fees. Plastic Pay at McDonald’s? No stranger to employment lawsuits, McDonald’s is facing a potential employment class action, with a new twist. The lawsuit was filed by an employee in Pennsylvania who alleges she was issued with a fee-loaded Chase Bank Debit card, instead of a paycheck. Yes, really. Natalie Gunshannon, a 27-year old single mother, worked at McDonalds in Luzerne County, PA, at an hourly rate of $7.44 from April 24 through May 15. When she received her first paycheck, it was not a check at all but rather a JP Morgan Chase debit card which would cost her $1.50 for ATM withdrawals, $5 for over-the-counter cash withdrawals, $1 per balance inquiry, 75 cents per online bill payment, and $15 for a lost or stolen card. Nice. I wonder who thought this one up. When Gunshannon asked if she could be paid by check she was allegedly told that the debit card was the only option. Furthermore, her future earnings would be deposited into the debit card account and she could access her money from there. “McDonald’s does not provide a choice for hourly employees to receive their justly earned wages through a bank check, cash or direct deposit,” the lawsuit said. Pennsylvania law states that employees are entitled to have a choice to be paid by check or cash. Flonase Settlements Approved. GSK will have to pony up $185 million in two recently approved settlements involving the marketing—or not—of Flonase nasal spray. They were facing two antitrust class actions both of which allege that GSK deliberately prevented generic versions of Flonase nasal spray from going to market. The Flonase settlements total $185 million, with $150 million designated for reimbursement to people and entities in the US who purchased Flonase directly from GSK at any time from May 19, 2004 until March 6, 2006. For complete information on this settlement, and to download forms, visit flonasedirectsettlement.com The case is, In re Flonase Antitrust Litigation, No. 08-CV-3149, is pending in the United States District Court for the Eastern District of Pennsylvania. A second class involving those who indirectly purchased Flonase and generic Flonase—will receive reimbursement from a $35 million settlement fund. These class members include anyone who purchased Flonase or generic Flonase for personal, family or household consumption in the United States and its territories from May 18, 2004 through March 31, 2009. Also included in the class is anyone who made co-payments or other partial out-of-pocket payments through their health plans. For complete information on this settlement visit flonasesettlement.com The case is In re Flonase Antitrust Litigation, Case No. 8-cv-3301 and Medical Mutual of Ohio v. GSK, Case No. 12-cv-4212 in the Eastern District of Pennsylvania. Okee dokee—that’s it for this week. A safe and happy weekend to all. See you at the bar! Going Organic Leads to Going to Hospital? Heads-up anyone who bought Townsend Farms Organic Anti-Oxidant Blend frozen berry and pomegranate seed mix: A woman who alleges she fell ill with a hepatitis A infection and was hospitalized after eating this product has filed a lawsuit against Oregon-based Townsend Farms. According to the food poisoning lawsuit, plaintiff Karen Echard purchased and consumed Townsend Farms Organic Anti-Oxidant Blend in the Phoenix area in April of 2013. Attorneys allege that she fell ill with symptoms of hepatitis A infection, including fever, chills, nausea, abdominal pains and jaundice during an illness that started on May 21. The Organic Frozen Berry Seed Mix class action states that Karen sought medical treatment for her illness on more than one occasion and was hospitalized for 5 days. Her attorneys allege that Karen, a healthcare practitioner and student, fears she will lose her job and be forced to discontinue her schoolwork due to her illness, as she continues to experience the effects of her hepatitis A infection. The Townsend Farms lawsuit asks for damages including physical injury, medical and medical-related expenses, wage and lost earning capacity damages. Lipitor Diabetes Link Looking at Lawsuit. Lipitor is making news—this time it all about what the anti-cholesterol drug shouldn’t be doing—allegedly. Pfizer, the maker of Lipitor (atorvastatin) is facing a mounting number of these personal injury lawsuits, alleging the drug causes diabetes. In fact, several of the initial Lipitor diabetes lawsuits have just been green lit for a Multi-district litigation—or MDL. The Lipitor lawsuits allege that Pfizer has failed to adequately warn consumers of the risk for developing diabetes associated with the statin. In 2012 Pfizer updated the Lipitor labeling to include warnings of increased risk for diabetes, however, the lawsuits contend that this was insufficient. Lipitor belongs to a class of drugs called statins, which are used to lower cholesterol by reducing blood levels of low-density lipoprotein (LDL) cholesterol, or “bad” cholesterol, a contributing factor in heart disease. A study (Culver AL, Ockene IS, Balasubramanian R, et al. “Statin Use and Risk of Diabetes Mellitus in Postmenopausal Women in the Women’s Health Initiative.” Archives of Internal Medicine, 2012,172(2): pp.144-152. ), completed in 2012, as part of the Women’s Health Initiative (WHI) found an association between the statin class of medications and the development of type 2 diabetes in women, particularly post-menopausal women. Clark’s lawsuit alleges Pfizer knew or should have known that there was a connection between Lipitor and diabetes before it was made publically available in 1997. Instead, the warning was only added to the product labeling in February 2012, after the FDA’s Division of Metabolism and Endocrinology Products requested that a warning be provided for consumers and the medical community. Crest Toothpaste, er, Crestfallen? A preliminary settlement has been reached in the consumer fraud class action lawsuit pending against Procter & Gamble Co (P&G). The lawsuit alleges the company falsely advertised the benefits of its Crest Sensitivity Treatment & Protection toothpaste. Specifically, the Crest lawsuit, entitled, Edward Rossi v. The Procter & Gamble Co., Case No. 11-07238 (JLL) (MAH), U.S. District Court, District of New Jersey, claims P&G engaged in misleading and deceptive advertising and marketing of its Crest Sensitivity Toothpaste. The tentative Crest toothpaste settlement, if approved, could include anyone in the US who purchased Crest Sensitivity Treatment & Protection toothpaste between February 2011 and March 2013. If you purchased this toothpaste between those dates, you may be eligible to claim a full or partial refund from the settlement. If approved, potential class members must submit a valid claim form and proof of purchase in order to receive damages. Class members with with proof of purchase will be able to claim a full refund of the purchase price they paid. Those without documentation will receive a refund of $4. Only one tube of Crest Sensitivity toothpaste will be refunded. Valid claim forms and any supporting documents must be postmarked no later than August 19, 2013. Detailed claims filing instructions are provided below. A Final Fairness Hearing will be held on September 12, 2013. Okee dokee—that’s it for this week—happy and safe weekend to you all—see you at the bar! The weekly wrap on top class action lawsuits and settlements for the week ending October 19, 2012. This week’s top stories include Healthcare workers at Maxim Healthcare, Electronic Arts and NFL Madden games and the first Chantix settlement. mine Lawrence, who was employed as a Home Health Aide by the defendant until October 2012. In the unpaid overtime lawsuit, Lawrence alleges that Maxim Healthcare Services Inc, violated, and continues to violate, the Ohio Minimum Fair Wage Standards Act (OMFWSA) because of its willful failure to compensate her and the class members at a rate not less than one and one-half times the regular rate of pay for work performed in excess of 40 hours in a workweek. Lawrence claims she regularly worked over 70 hours per week while employed by Maxim Healthcare and the majority of her time was spent performing general housekeeping duties as opposed to patient care. Lawrence also alleges that she and the members of the putative class who are employed by the Defendant in Ohio are “employees” within the meaning of the OMFWSA. Lawrence, the lead plaintiff in the employment class action, seeks to bring her claim for violation of the Fair labor Standards Act (FLSA) as a nation-wide collective action, and as a statewide class action based for violation of the OMFWSA. Maxim Healthcare Services, Inc, is a Maryland corporation which, through hundreds of office locations nationwide, provides in-home personal care, management and/or treatment of a variety of conditions by nurses, therapists, medical social workers, and home health aides. Lawrence and the class are represented by Ben Stewart of Stewart Law PLLC. And it’s a Touchdown! The Plaintiffs score a proposed $27 million settlement that’s been reached in a class action lawsuit pending against Electronic Arts. The Electronic Arts settlement, if approved, will apply to anyone who purchased a new copy of an EA Madden NFL, NCAA Football or Arena Football video game between 2005 and 2012 and is an eligible class member. And the skinny on the proposed deal: Class Members of the EA football game class action settlement include all U.S. consumers who bought a new copy of an Electronic Arts’ Madden NFL, NCAA Football, or Arena Football video game for Xbox, Xbox 360, PlayStation 2, PlayStation 3, GameCube, PC, or Wii, with a release date of January 1, 2005 to June 21, 2012. If you are an eligible Settlement Class Member, your share of the net proceeds of the Settlement will be based upon the number of video game titles you purchased new, as well as the number of Settlement Class Members who submit valid claims. Valid claims for the purchase of Madden NFL, NCAA Football, or Arena Football video games for the Xbox, PlayStation 2, PC, or GameCube platforms (“Sixth Generation Purchasers”) will be valued at $6.79 per new game purchased, up to a total of eight units ($54.32). Valid claims for the purchase of Madden NFL, NCAA Football, or Arena Football video games for the Xbox 360, PlayStation 3, or Wii platforms (“Seventh Generation Purchasers”) will be valued at $1.95 per new game purchased, up to a total of eight units ($15.60). The only way to receive cash benefits from the EA antitrust settlement is to submit a Claim Form either online at EASportsLitigation.com or postmarked no later than March 5, 2013. Here’s a Bittersweet Ending… A settlement has been reached in a lawsuit against Pfizer and its anti-smoking drug Chantix. The Pfizer Chantix settlement, the details of which remain confidential, was reached just prior to the case going to trial. The lawsuit was brought by the widow of Mark Alan Whitely, from Minnesota, who allegedly killed himself in November 2007 as a result of taking the controversial drug. The lawsuit alleged that Pfizer failed to sufficiently warn that Chantix could increase the risk of suicide. FYI—in July 2009, the FDA announced an update to Chantix (known generically as varenicline) warnings, alerting patients to the risk of serious mental health events linked to use of the smoking cessation drug. Pfizer, maker of Chantix, was required to put a Boxed Warning on the Chantix label, highlighting the risk of depressed mood, hostility and suicidal thoughts when using the medication. When the FDA made its announcement in 2009, it had received 98 crude reports of completed suicide associated with Chantix (a crude report means the FDA had not examined each report in depth to ensure there were no duplicates). It had a further 188 crude reports of suicide attempts. The Whitely lawsuit is reportedly the first of some 2,500 Chantix cases that have been combined in a multidistrict litigation (MDL) in Alabama for pretrial evidence-gathering and the first trials. The consolidated cases are In re Chantix (Varenicline) Products Liability Litigation MDL 2092, 09-cv-2039 U.S. District Court, Northern District of Alabama (Florence). The consolidated cases are In re Chantix (Varenicline) Products Liability Litigation MDL 2092, 09-cv-2039 U.S. District Court, Northern District of Alabama (Florence). Miss-Match.com? The Dallas-based internet dating site Match.com is being sued over allegations that it misleads its customers about potential matches with people who are no longer active members. Ask for Generic? Mmmaybe not. Sometimes it’s best to skip the generic version—and such may be the case with Budeprion XL, a generic formulation of the antidepressant Wellbutrin XL; the makers of Budeprion XL are the subject of a class action lawsuit filed this week in California. The problem seems to be that the generic form of the drug is not as effective and possibly not as safe as the patented version, so the suit alleges. The FDA has so far said the drug is safe, but they could order a special clinical trial to better assess the safety and efficacy of the generic version. “Expedia-dot-CON?” Maybe that’s how the jingle should go after the recent judgement against the internet travel site. Unhappy customers who joined a class action lawsuit alleging breach of contract will see the travel giant fork over $184 million in settlement monies. What did they do? Expedia bundled the service-fee charges with taxes into a single line item, failing to disclose the separate amounts of each to consumers. Because Expedia only remits taxes based on the wholesale price—which it never disclosed to consumers—the taxes appear higher to consumers than they actually are, and Expedia is able to mask the considerable size of its service fees. Nice.